Car delivered to Wide World of Motors, Spring Valley NY with incorrect Cyl heads (348). 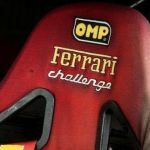 car sent back to Ferrari Italy for engine "correction" Then proceeded to win in the Challenge series. Car has been and continues to be titled, street registered in the USA. One of the original 32 to still fly it's true colors as intended. Last edited by SoCalTim on Tue 23. May 2017, 20:54, edited 5 times in total. Cool car, can I post it? One of the most famous 355 Challenge !!! Some real interesting stories for sure. Amazing 355 Challenge, one of the most known car!